Amazing Grass Green Superfood seemed like the natural choice for my second Super Greens. Amazing Grass Green Superfood is a popular Greens supplement, it is advertised as combining alkalizing farm fresh greens and wholesome fruits and veggies into a nutrient-rich superfood. I ordered most of my Green Superfoods from Amazon in the UK and brought them back home to Malaysia on my last trip to visit family and friends. I could have ordered from Amazon to have shipped to Malaysia but it’s not quick and some merchants don’t like shipping here. I had a good experience trying my first Super Greens (see my Athletic Greens review) and was keen to see how I got on with Amazing Grass Super Greens. Since writing this review, I have been drinking the greens supplement every morning for the last 7 days. How does Amazing Grass Taste? Does Amazing Grass Green Superfood work? Where To Buy Amazing Grass ? There are a number of serving sizes and flavors but I went with the Original Flavor and the 30 servings tub. It’s easy to see which flavour you have because the label on the tub is color coded – mine being Original is green. As well as Original, you can also get Berry, Chocolate, Holiday Cookie, Orange Dream and Pumpkin Spice and the first three flavors are available in both 30 and 60 serving tubs, the last three in 30 serving tubs only, although I am not sure why. Mixing my first scoop of 8g Amazing Grass Green powder with 200ml of cold water I noticed it was less frothy than Athletic Greens. Even after quite a vigorous stirring the green powder could still be seen floating in the water. My first impression of the drink was that it’s not as appealing as Athletic Greens. The taste certainly has a grassy taste and so this is certainly one for mixing with another drink, even combining with fruits or possibly yoghurt, as some consumers have suggested. Back in 2002 two guys, Brandon and Todd discovered they both had a passion for outdoor healthy lifestyles. When Brandon convinced Todd to try his green drink instead of his usual coffee, he was sold and so were their friends and co-workers. They teamed up to start the company Amazing Grass and to this day are a popular choice with consumers. Amazing Grass stock a large number of supplements for both adults and kids, they mostly focus on health and wellness. As well as powdered supplements, they have effervescent tablets, organic Superfood bars, capsules and accessories like shaker cups and t-shirts. I really like that a proportion of each sale goes towards supporting “The Whole Planet Foundation”, a charity that works with local communities around the world to lift them out of poverty. This is really great, although I was unable to find out any further information on how much they support the foundation. Reading through some of the Amazon customer reviews it sounds as if the formula changed sometime in 2017. I searched for more information on this but was unable to dig up anything on it. 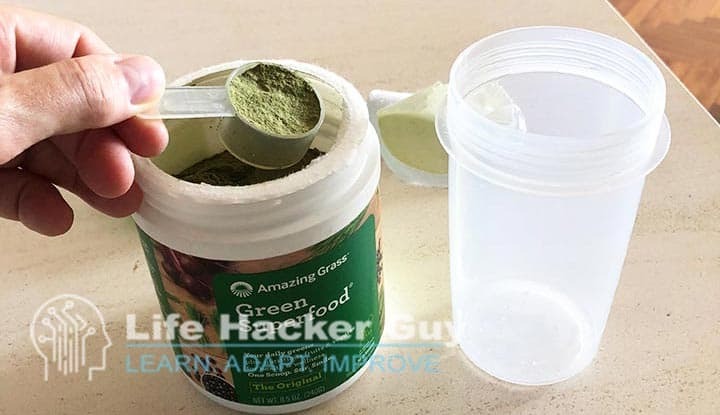 So, I cannot confirm if the Amazing Grass Green Superfood formula has been changed. My pet hate as you will hear in several of my reviews are Proprietary blends! More on this in a different article. Okay so I got that out of my system, well sort of. Looking further, I immediately see my second Super Green supplement is also hiding their ingredients using a pseudo-scientific blend. 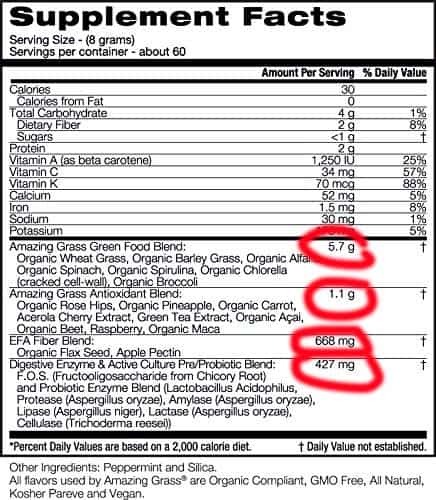 Again, it’s impossible to really tell how much of the individual ingredient amounts are present in Amazing Grass Green Superfood ingredient list. The label only lists them in the order of largest amount in the blend. This is disappointing, but it is a familiar practice with supplements these days. On a positive note, many of the ingredients are Organic and the usual suspects are evident, such as Spirulina, Spinach, Chorella, Wheat and Barley Grass etc. Although many of the ingredients are Organic the product is not certified Organic – Having said this very few Super Greens are USDA certified. The fact the supplement isn’t 100% organic is not an issue for me, it’s nice that the Greens and many of the other ingredients are organic though. 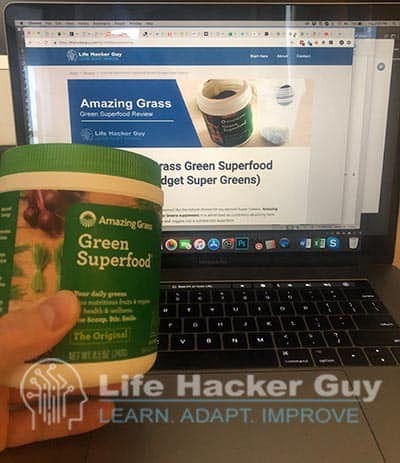 Following a popular trend with Super Greens, Amazing Grass have included a “Pre/Probiotic blend”, as discussed in my Super Greens and Probiotics section, including these are most likely for window dressing and will not serve any nutritional purpose. I found the supplement label lacking in nutritional information. No details of individual ingredient amount and actually what does “lots of antioxidants” really mean? Would drinking a serving of Amazing Grass green powder per day give you all your veggie and antioxidant needs? It’s doubtful. The inclusion of fiber is great, but I don’t believe 668mg will give you that much so that it will have any meaningful impact, especially as the daily intake is 25-38gms of fiber per day (source). You would get over 5 times more fiber from eating just a small apple. Organic Wheat Grass, Organic Barley Grass, Organic Alfalfa, Organic Spinach, Organic Spirulina, Organic Chorella (cracked cell wall), Organic Broccoli. Organic Rose Hips, Organic Pineapple, Organic Carrot, Acerola Cherry Extract, Green Tea Extract, Organic Acai, Organic Beet, Raspberry, Organic Maca. Organic Flax seed, Apple Pectin. F.O.S. (fructooligosaccharides from chicory root) and Probiotic Enzyme blend (L. acidophilus, alpha and beta amylase, Lipase, Lactase, Cellulase). 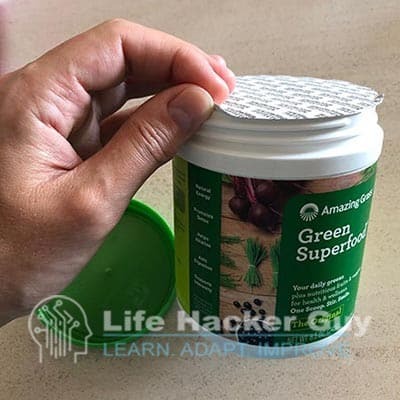 After opening the tub and removing the protective cover you can smell the Super Greens powder. It’s not unpleasant but smells very earthy, like mown grass. The taste is okay, certainly has more of a “grassy” taste than some of the other Super Greens I have tried. Although it didn’t put me off drinking it, it doesn’t taste as great as other green supplements I have tried – such as Athletic Greens. However, the taste did linger in the mouth a little too long. This is something I wasn’t so keen on and I took to drinking another glass of water afterwards to “rinse” my mouth out. Checking out what other customers have said about the taste it seems mixing it with another drink is the answer to making it taste better! The first time I tried Amazing Grass super greens was after lunch, I had mild stomach discomfort but could have been due to something else I ate at lunch. The next morning, I experienced no issues after taking it. Trying Amazing Grass super food for the following 6 days was fine too, so the mild stomach ache on the first day was a one-off. Reading other customer’s experience with Amazing Grass, it does seem that some people suffer from mild stomach upset. This soon disappears though and could occur when getting used to the product. To be fair, is not an uncommon issue with this type of supplement. As outlined above, it’s difficult to tell due to the use of a proprietary blend. We know that there is a minimum required dose required in order to have an effect, whether Green Superfood contains enough is doubtful considering the number of ingredients in the blend. I say doubtful as we don’t know, but I suspect if the amounts were higher this would be shown on the bottle. To give an example, according to Examine the daily dose for Spirulina is between 1-8g, in the “Amazing Grass Green Food Blend” there are seven ingredients amounting to 5.7g, Spirulina is 5th in the list. With Organic Wheat Grass being the main ingredient in terms of quantity in the blend, it’s unlikely that Spirulina makes up 20-25% of this blend. Sadly, we will never know unfortunately. The same goes for Chorella, which is needed in even higher dosages. The antioxidant blend of ingredients reads to be like something out of a diet supplement, a fad fat burner with the latest “Superfoods”. The quantities are similar too, with the blend coming to 1.1g the same quantity seen in two standard capsules. Again, very unlikely to have enough to do much, if anything. I checked out the Amazing Grass Green Superfood reviews online and the common customer complaints seem to be around the change in formula back in 2017 and the taste. You’ve got to mix it with something, but finding your right combination is like hitting the jackpot. However, it’s worthwhile keeping in mind that taste is highly subjective. On the plus side there are many Amazing Grass Amazon reviews, at the time of writing this article over 8,350 customer reviews with an average rating of 4.2 out of 5. Over 75% of consumers gave Green Superfood 4 or 5 stars. The returns policy does depend on where you have purchased your Amazing Grass greens from but there doesn’t appear to be a way to try the supplement and returning it if you don’t like it. So, the 30-day money-back guarantee ONLY applies to unopened products and will only consider exchanging your product for another one. If you return unopened products you won’t receive a full refund either as any shipping costs are deducted along with a $15 handling fee. This seems fairly high especially considering this works out to be 50% of the monthly product cost! For a company that “stands behind our products” the money-back guarantee is pretty poor, come on guys. You can buy Amazing Grass from a number of high street stores such as Walmart, Target, GNC and lots of smaller retainers. You can also buy Amazing Grass online from a number of popular sites like iHerb, VitaminShoppe, Vitacost, Bodybuilding.com and of course directly from the official website. Like I did, you can also buy from their Amazon Store, so if you’re an Amazon Prime member you may wish to try this and save on delivery charges and waiting times. I found the costs to be a little cheaper on Amazon too! The cost of Amazing Grass Green Superfood varies according to seven available serving sizes and flavors. This Super Greens is also available in different forms, such as sachets, powders and capsules too, although I wouldn’t recommend Amazing Grass Super Green capsules as they won’t deliver enough ingredients easily. Currently Amazing Grass super greens can be bought in 15 sachet box, 30, 60 and 100 servings tub, and in 150 capsule bottles. Flavors include Original, Berry, Chocolate and Orange Dream (currently not available on Amazon). You can buy the range of Amazing Grass Super Greens on Amazon here. This is one of the cheapest Super Greens I have seen on the market. Unfortunately for me at least this was reflected in the taste and the amount of ingredients available in each serving. This is one of the cheapest Super Greens I have seen on the market. With the huge doubt over the quantity of the ingredients and to ensure you consume enough, you would likely have to take a minimum of two servings per day. Doing so makes Amazing Grass Super Greens supplement comparable in price to more premium products. Saying all this it’s difficult to see what is to be gained from choosing this brand over a better brand that is open with its ingredients. This is marketed completely differently to Athletic Greens as this is much cheaper at under $30 per month. As a consequence, you get less ingredients per serving (8g) but it does contain a good range of Super Greens and digestive enzymes, although we’ve discussed probiotics before and it’s more a matter of if you think they are beneficial, I’m of the opinion they’re not much use . I wasn’t keen on the taste when consuming directly with water. This did put me off the product and would affect my decision to buy this for everyday use. The refund policy is poor for a company of long-standing and appears to have a good customer base, according to the number of customer reviews and how long they have been running. Basically, if you buy the product that’s it, you either try it and use it, or exchange it for another one of their products (if you’re lucky). In summary, if you’re on a budget and looking for a cheap way to get some of the Super Greens in your diet and can put up with the taste, then Amazing Grass Green Superfood could be a choice. Buying something because it is in budget isn’t a sensible solution for me, especially as I don’t know if I will get the right amounts. For me, I am looking for something that I know what the ingredients are and the amounts and they they to work for me. So, I am skipping Amazing Grass Superfood greens and will keep searching. Have you tried Amazing Grass Green Superfood or a regular user? Then please comment below as I would like to hear your experience. Hi, I'm Adam the founder of the Life Hacker Guy. I have a First Class Honours degree in Sports Science from Brighton University, specialising in exercise physiology and nutrition. In my youth I was a competitive Triathlete and long-distance runner placing top 10 in most triathlon races I completed. 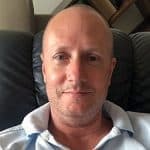 Since suffering from Chronic Fatigue Syndrome, I moved into web development, after a couple of years I then moved onto developing a number of online businesses. I've recently taken a sabbatical and I'm now looking to make big changes in my life, hopefully this may resonate with you - join me in my journey! LifeHackerGuy.com is a participant in the Amazon Services LLC Associates Program, an affiliate advertising program designed to provide a means for sites to earn advertising fees by advertising and linking to Amazon.com. Always consult with a qualified healthcare professional prior to beginning any diet or exercise program or taking any dietary supplement. The content on our website is for informational and educational purposes only and is not intended as medical advice or financial advice and does not replace a relationship with a qualified healthcare and finance professional. LifeHackerGuy.com and/or it’s authors do not in any way claim that you can earn any money from investing, speculating or trading in any of the finance related instruments mentioned on this website. Copyright 2019 by Life Hacker Guy.